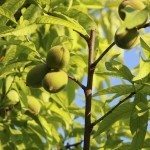 How can I treat my peach tree that looks like it has Gummosis disease. Should the limbs be cut away that are affected? Depending on the cause, you can either trim or leave them. Gummosis is a very broad term that describes the sap leaking, but itself is not a condition. If this is caused by a canker disease, then you will want to cut affected limbs. Cankers aren't able to be cured, so removal is necessary. If it is from pests, or tools, or any other mechanical method, then pruning is unnecessary.